Smart and Stunning Female Engineers – Page 5 – There is strength and value in being smart and stunning! I will like to say that every person should be proud of where they are from. It gives me joy and pride when I think of my beautiful family, village and state. Like my people chant when there are celebrations:” Ocho cho cho cho cho cho cho cho cho cho cho….uwo uwo uwo… ochee…eehe..”. Trust me, this chant is awesome!!! Rivers State is the Southern part of Nigeria and is filled with very rich culture. Growing up was fun while making friends and trying to learn different languages or slangs. This was pretty easy because I could easily blend in most parts of the country. Going abroad to school with other people came with a lot of accent challenges, cultural differences, and lifestyles but through it all it takes very good interpersonal skills to work through it just to live comfortably around others. It does take a lot to live, study or work in other areas, remote location or countries. For the typical Nigerian child, education is a “must”. Studying Engineering was never my first choice but I ended up as an Engineer because I felt I was good with subjects associated with the degree. I started over time to motivate myself in order to enjoy the exceptional benefits of Engineering. This is why I am passionate about getting other adults informed and engaged, volunteer activities, and career day sessions for younger ones to start planning way ahead. Being able to share my experience, cultural values, food and professional background with others that are genuinely interested is truly emotional. It is a unique skill that keys into a remarkable comfort level when working with fellow colleagues or during social professional networking events. 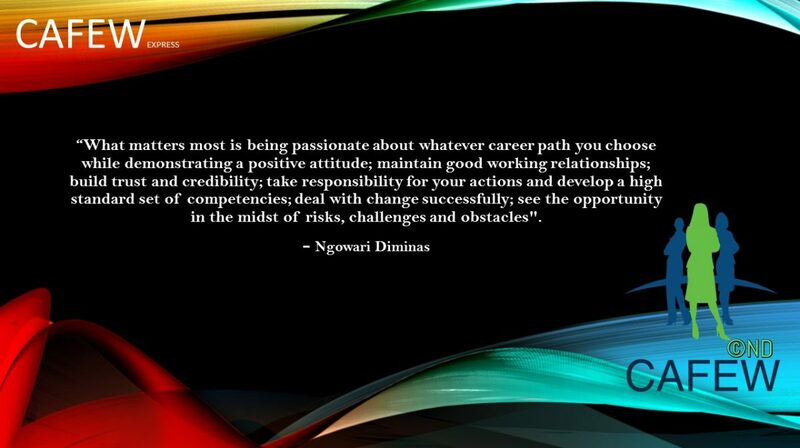 What matters most is being passionate about whatever career path you choose while demonstrating a positive attitude; maintain good working relationships; build trust and credibility; take responsibility for your actions and develop a high standard set of competencies; deal with change successfully; see the opportunity in the midst of risks, challenges and obstacles. Author Ngowari DiminasPosted on March 16, 2017 2 Comments on Proudly Ekpeye! Proudly Nigerian! Success- What does this really mean?? This is my opinion of what Success actually means….. Success is definition….definition of one’s personal goals. Success is challenging….challenging one’s ability to defined tasks. Success is sustainable….sustainable foundation to maintain new goals. Success is fulfilment……fulfilment of one’s personal ambition. Success is unlimited….unlimited in all aspects of life. Success is meaningful….meaningful depending on one’s success factors. Success is achievable….achievable by everyone. Success is available…..available to everyone. Success is beautiful….beautiful in the eyes of those who appreciate. Success is love…. We must all learn to show love to people around us, encourage and celebrate Success as defined by one another. Author Ngowari DiminasPosted on March 15, 2017 1 Comment on Success- What does this really mean?? What more can I say?? I am so happy and excited about this blog. Engineering is a reputable career. Female Engineers are strong, bold and respected. The Engineering Career comes with continous hard work, development, determination and working through challenges to attain goals. Sharing beautiful experiences, achievements, technologies and family life while coping with work will enable strength in promoting and connecting other female Engineers or upcoming Engineers. I am so glad to be an Engineer. I acknowledge that we all need to keep being determined and focused. Most Female Engineers ask high performance questions when necessary, study a lot and research for facts which leads to professional excellence. We are simply Smart and Stunning! Author Ngowari DiminasPosted on March 15, 2017 March 15, 2017 1 Comment on Smart and Stunning! The burden of misplaced priorities is not worth it. Always follow your personal navigation system. Life does not have a straightforward path to follow. One’s desired path to success and sustainability as defined by the person sets a productive foundation. Each individual’s criteria for success vary and should be respected. People often tend to get on the path of self-destruction by taking their eyes of their personal path plan and focus more on others excessively which includes paying too much attention to others’ career, lifestyle, background, experience etc. This leads to the massive burden that comes with misplaced priorities. Self-inflicting unnecessary pressure to attain a financial, educational or social status is one of the dangerous outcomes anyone can find him/herself in. Have you asked yourself: “Why do I care what others think about me?” Self-deceit is another huge one. You should tell yourself the truth!!! Unhealthy and baseless competition with others takes you way off your personal path. Most times, others have no clue that you are trying to compete with them. Every person has their own unique channel and talent towards productive motivation. Talent is unique to each person so it is highly necessary to nurture it. Dream big, work hard consistently, develop skills continuously, volunteer, read & research always to increase your knowledge bank and most of all pray always. VISION – Always visualizing yourself in the big picture is vital. Looking at where you see yourself after a certain period of time is what gives you the insights on what your personal goals are and how realistic it may be. APPROACH – You need to look into how you approach situations in your daily activities. It is necessary to check your attitude with people at work, business and family. Always remember that you alone are responsible for making sure your goals are met. VALUES – This is where you need to hold yourself accountable and responsible for your work. There should be a high level of integrity that you need to set. PLAN – This is a very critical activity everyone needs to have in their daily tasks. You need to plan everything. This is where you can identify what you need in the future in terms of resources. Time is one of our most valuable assets so using it is best to use it positively. PROBLEMS – Ensure that you are ready to clearly identify problems faced along your career path. Always try to find ways to resolve them. Do not blame others and even though others might be responsible, try to have alternative options to overcome them in the future. MONITOR & REVIEW – Real time self-monitoring and reviewing your goals at different stages helps to keep you in check on your progress. At this stage, you can easily re-define your goals, integrate some of them or even move forward to later stages. SKILLS – Self-improvement is a key factor to career sustainability. You should always check your skills at various stages of your career. Identifying the right skills required for each goal is imperative. There are so many continuing professional development courses/trainings and hands-on training that is useful and required as the world is changing really fast. WILLINGNESS TO LEARN – Often times, people feel they have enough knowledge and therefor don’t need to learn from others or read more books. The fact is that reading, researching, on-line access to webinars or libraries and magazines exposes you to continuous knowledge. ENGAGEMENT – It is highly recommended to maintain a good level of social-professional association. If it is possible, be a volunteer and also attend various professional events and participate in question & answer sessions. Networking with others is great. FOCUS – This is the part that requires you to remain encouraged no matter what obstacles you face. It is imperative to remain focused at all times. There are many times goals will not be met but one needs to have eyes on the vision. Remember to keep it moving and continue to explore new ideas. It is very important to believe in whatever career path you have decided to follow with great passion and continuous hard work. What more can I say?? I am so happy to and excited about this blog. Engineering is a reputable career. Author Ngowari DiminasPosted on March 15, 2017 3 Comments on Smart and Stunning!